Cleveland’s own award-winning chef and Food Network star Michael Symon is taking his culinary talent to a whole new arena. The Cleveland Cavaliers and ARAMARK­ a world-class leader in professional services and the Cavs’ exclusive food and beverage provider­have teamed up with Symon to bring his signature cuisine to Quicken Loans Arena. The partnership with Symon, winner of the James Beard Foundation’s award for the 2009 “Best Chef in the Great Lakes Region,” is one of many new food and service enhancements to be introduced this season at Quicken Loans Arena. 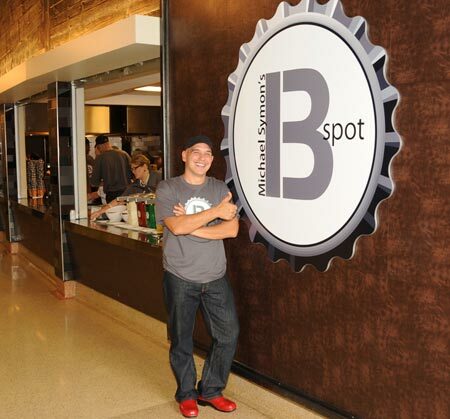 Michael Symon at his B-Spot at Quicken Loans Arena. As part of the partnership, two Symon-branded dining destinations at The Q will be open for all Cavaliers games and for most arena events. Additionally, customized catering packages, featuring Symon’s signature menu, will be designed exclusively for arena suite-holders. The B Spot… burgers, beers and brats, named after Symon’s soon-to-be opened restaurant at Eton in Woodmere, Ohio, will be located off the Quicken Loans Arena main concourse near the Cavaliers Team Shop. The menu will feature his signature burgers, brats and craft beers. Plain Jane with Cheese – you get the drift! There will also be menu options for Arena Suite-holders. Fans attending games this season will also notice significant changes and enhancements that bring the fun and energy of Cavaliers, Monsters and Quicken Loans Arena events to dining locations throughout The Q. An added emphasis has been put on offering a menu with more variety, quality and freshness. Copyright © 2009 ClevelandWomen.Com. All Rights Reserved.